The quarterly Competition Distortions Dossier is not an analytic and exhaustive research but rather a collection of articles and small analysis based on reliable published sources. It not only covers reforms and policies that the Government of Vietnam have put in place in the period which is likely to have an impact on the competitive process and consumer protection but also deals with cases of violations of the above-mentioned laws and regulations. 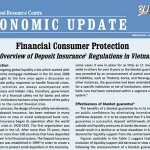 During 2011-2013, the dossiers were produced in the form of quarterly “Competition and Consumer Protection Dossier” which provides an overview of constantly evolving laws and cases in Vietnam which are related to both competition and consumer protection.